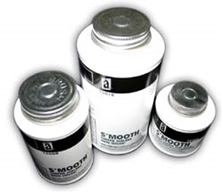 S'MOOTH™ is a general-purpose metal pipe thread sealant for industrial and residential use. This white paste has a smooth consistency and no grit. Not for oxygen use. Applications: Pipe thread sealant for 1/2" to 2" NPT metal piping. For systems carrying water, steam, compressed air, natural gas, sprinkler systems, gasoline, diesel fuel, kerosene, heating oil, propane, anti-freeze solutions, refrigeration gases, dilute acids, caustics, and many other common chemicals. Use for repair and maintenance in many industries including marine, automotive, plumbing, pool and spa, food service, agricultural, institutional, municipal, and utilities.